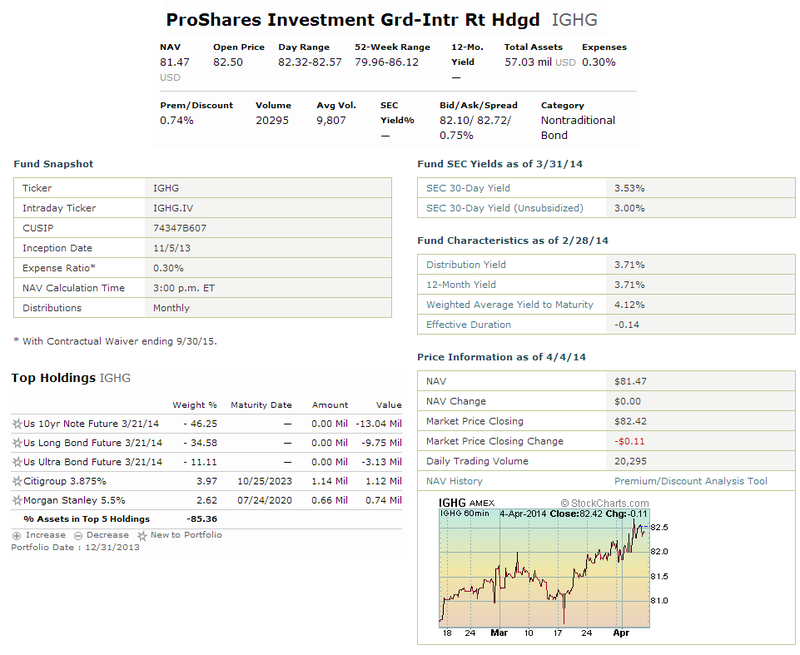 Find Proshares interest rate hedged ETFs review. The funds are Proshares Investment Grade-Interest Rate Hedged ETF (IGHG) & Proshares High Yield-Interest Rate Hedged ETF (HYHG). Interest rate has been rising for the past year. Investors need to get a grip of this rising rate if they invest in bond fund. Various ETF providers have offered a way to hedge through exchange traded funds (ETFs). Proshares offer 2 of these hedge ETFs such as Proshares Investment Grade-Interest Rate Hedged ETF (IGHG) & Proshares High Yield-Interest Rate Hedged ETF (HYHG). 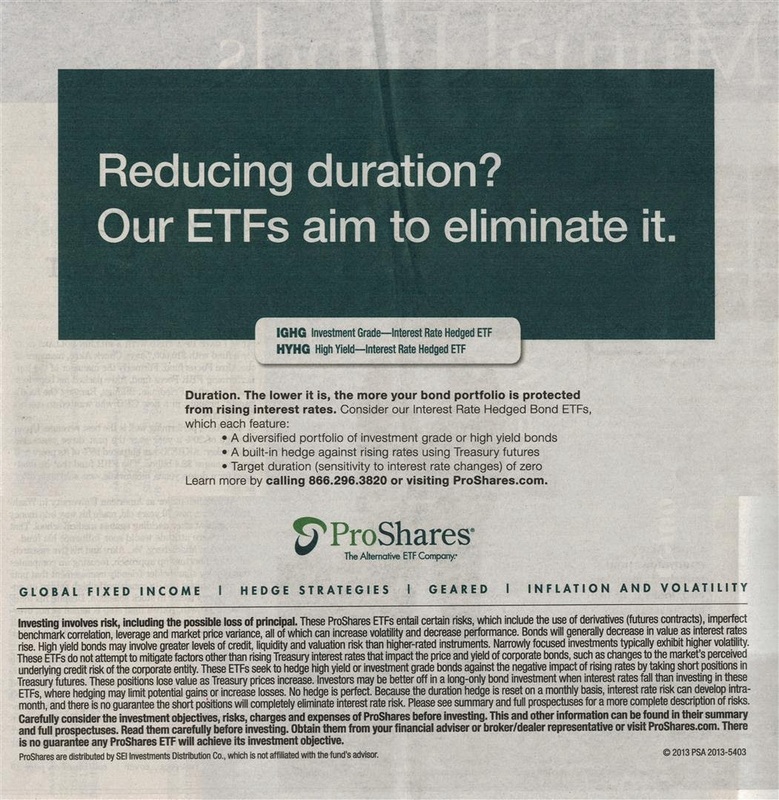 Our ETFs aim to eliminate it. The ProShares High Yield-Interest Rate Hedged (HYHG) was introduced earlier in May 2013, while the ProShares Investment Grade-Interest Rate Hedged (IGHG) was introduced in November 2013. They haven’t had rating from Morningstar yet. The total net assets of HYHG are $95.77 million while IGHG has $32.40 million of assets. IGHG is currently traded at premium 0.69% from its NAV and HYHG at 0.46% premium from its NAV. The IGHG fund has YTD return of -0.66%. The 30-day SEC yield is 3.98%. It also has 0.04 years of effective duration. The 12-month yield is 3.76%. The top sector breakdown is Finance-Bank (26.20%) and Industrial-Service (20.88%). The HYHG fund has a yield of 4.84%. This yield is distributed on monthly basis. The CUSIP is 74348A541. It also has -0.20% YTD return as of February 20, 2014. The weighted average yield to maturity is 6.91%. It has total 140 holdings. The top sector breakdowns are Industrial-Service (33.67%), Industrial-Manufacturing (27.93%) and Industrial-Energy (16.99%). Proshares Investment Grade-Interest Rate Hedged ETF (IGHG) & Proshares High Yield-Interest Rate Hedged ETF (HYHG) are new ETFs. Long term history is still unknown. Federal Reserve may or may not hike interest rate. The IGHG fund has an expense ratio fee of 0.30% while The HYHG fund has an expense ratio fee of 0.50%.